A high-speed machine which cuts only one side of the envelope, leaving no scrap. 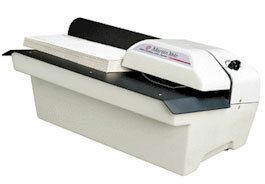 Automatically feeds and opens a stack of envelopes at a speed of up to 12,000 envelopes/hour. Opens envelopes up to 1⁄4" thick. Accepts a 3" tall stack of envelopes. Adjustable cut width to accommodate different envelope sizes and types. Non-skid feet for added safety. Ideal for large businesses and mailrooms.